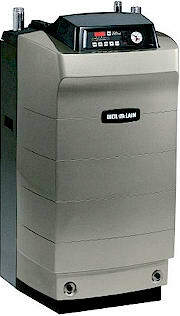 The EG Gas Boiler from Weil McLain is an Atmospheric Gas Boiler. . The EG Series is a flexible gas fired, cast iron boiler perfect for water or steam. There 8 different models in the EG Series, EG-30, EG-35, EG-40, EG-45, EG-50, EG-55, EG-65 and EG-75. The Hot Water has a heating capacity of 53,000 Btu’s per hour and 209,000 Btu’s per hour. The Steam capacity is 192 to 750 square feet. The EG Series can be used for Residential Homes, Commercial Buildings, Industrial and even Institutions such as Schools and Hospitals. The EG Gas Boiler comes with a factory installed automatic vent damper which are used with high efficiency boilers and boilers with a reduced fuel consumption. The EG Series is a high efficiency boiler that is designed to save the owners fuel in the winter months when it is most expensive. The EG Series has a Compact Design that makes installation easier and will save you space in what may already be a crowded basement. The EG Series is low maintenance but in the case that you need a yearly service or maybe you have a problem, these boilers have very accessible controls with a top cleaning system and vertical flue ways. The Boiler is surrounded with a Steel Jacket design to help to keep in heat and reduce heat loss. The boilers are well insulated and are rust and corrosion proof. This helps in prolonging the life of the boiler. The boiler comes with factory installed stainless steel burner. With a steel burner it also ensures the quietness of the boiler. 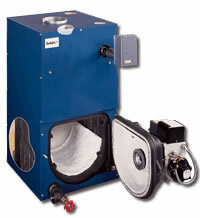 These burners will also provide a fixed primary air that requires no air adjustments. The EG Series Boilers have automatic vent dampers that are approved by Weil McLain. These dampers are all standard on the boilers with the exception of model EG-75. These dampers are created to help keep in the heat from the boiler while it is hooked up through a chimney. The boiler sections are made from Cast Iron, which are strong and reliable parts. These will keep the boiler from losing a lot of heat. The vertical flue ways are held with heat pins that will cause the hot gases to form and pass through the heat exchanger with perfect precision. 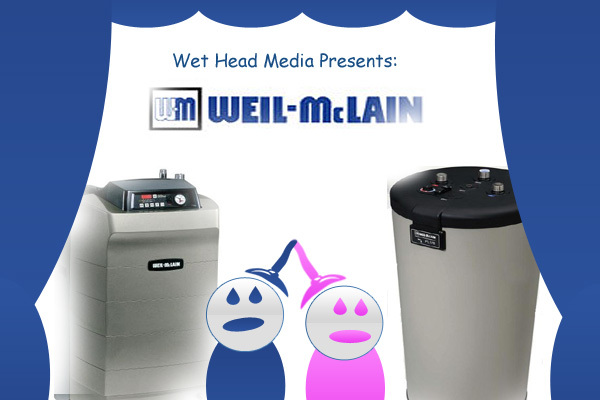 Weil McLain prides themselves on providing their customers with only the best products. So they created an option to the EG Series Boilers, model numbers EG-35 to EG-75 have openings that can be equipped with a tankless water heater. There are 2 openings located at the left end section, one opening is for the water heater and the other is for steam. 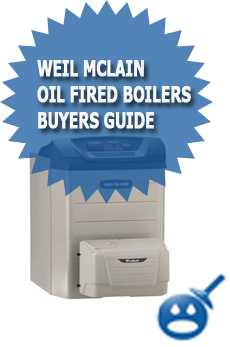 Weil McLain is one of the leaders in the heating industry, they are known for their boilers as well as for their customer service. They work hard to make sure that all of their customers heating needs are met. 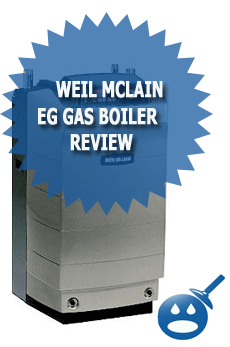 The EG Series is just one of the premier boilers that Weil McLain has to offer. my boiler is weil maclain eg 75 spn must be 15 years old. there are 2 pressure control nest to each other. with pressure gauge in between them, located on the side wall of the boiler. it look like they are on same line ??? my question: what the setting should be for the control on the left of the gauge and for the one on the right with the spiral pipe…one more how often can i change all the water in the boiler and when i do that do I need some kind of water treatment? CMG boiler Model CGM-4 how often do you have to change the water in and how do you bleed it? That picture is not the EG Series 4 (steam or water), its one of the Ultra water boilers. Right? I am interested in purchasing a home that has a EGH-75 Wel-mclain boiler. I want to figure out how old it it? It looks to be in pretty good shape, but am interested in finding out the age. any idea’s when they first started making this model boiler? And also can this boiler be multi-zoned? Thank you.